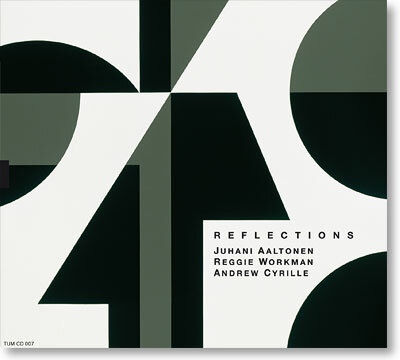 Reflections features three giants of improvised music in an open dialogue built on both their shared influences and their different backgrounds: Juhani Aaltonen on tenor saxophone and flute, Reggie Workman on bass and Andrew Cyrille on drums. The album can be seen as a companion to Strings Revisited (TUM CD 003), which featured the trio together with The Avanti! Chamber Orchestra conducted by Henrik Otto Donner. On Reflections, the music is improvised within only a loose compositional framework. Composed themes are used only as a starting point and, with the exception of Andrew Cyrille´s "The Navigator", there are no pre-conceived arrangements.